Powers/Abilities: Dr. Strangefate is a powerful metamutant telepath and quite possibly the Amalgam Universe's most powerful sorcerer. He also possesses several mystic artifacts, such as the Cloak of Levitation and the All-Seeing Eye, which further enhance his magical abilities. History: While traveling through the Himalayas, metamutant Charles Xavier was rescued by Nabu the Ancient One, who was the Lord Supreme of Order of the Amalgam Universe at the time. Taught the mysteries of the supernatural world at the feet of the Nabu, Xavier tapped the energies of forces both telepathic and mystical, making the dour sorcerer one of the most powerful beings in the Amalgam Universe. 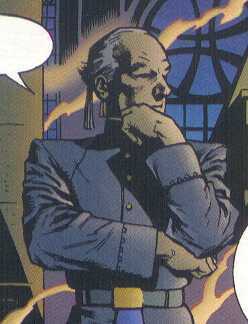 Already a powerful metamutant telepath, Xavier soon surpassed his teacher and took over as Lord Supreme of Order. One of the founding members of the Judgment League: Avengers, Dr. Strangefate moved on to more solitary pursuits in shadowy realms, leaving common protection to lesser mortals. Dr. Strangefate was the only native of the Amalgam Universe with the awareness that his very being was wrong. His mystic perceptions told him that something was not right with the very universe, and he pursued the answer to this troubling awareness. (DC vs. Marvel#3)- With the embodiments of the Marvel and DC multiverses intent on wiping one another out of existence, the two guardians of the respective multiverses, the Marvel's Living Tribunal and DC's Spectre joined hands and attempted to save both multiverses by merging them into one Amalgam multiverse and starting everything over again. Dr. Strangefate, an amalgam of Dr. Strange and Professor X of the mainstream Marvel Universe with Dr. Fate of the mainstream DC Universe, was one of the many characters brought into existence. (Dr.Strangefate#1)- Within his sanctum atop Arkham Tower in the city of New Gotham, Dr. Strangefate instructed his servant Myx to summon the most reliable of his agents: Skulk, Jade Nova, and White Witch. Past circumstances had placed each of these agents in Strangefate's debt. Strangefate instructed his three agents to seek out the outsider known as Access (who threatened the fabric of the amalgamated reality) and deliver him back to Arkham Tower. After Myx used his powers to disperse the others, Strangefate revealed that the agents were merely pawns who served to probe and determine the strengths and weaknesses of Access so that Strangefate would know what to expect before he engaged him. The White Witch successfully immobilized Access and brought him back to Strangefate's sanctum. Strangefate revealed that he was aware that Access was the lone survivor of the two multiverses from which the Amalgam multiverse was constructed. Strangefate also claimed to know that Access held within him the keys to restoring those multiverses, thereby destroying the Amalgam multiverse. Strangefate was about to forfeit Access' life in order to preserve the continuation of the Amalgam multiverse and used his All-Seeing Eye to erase Access from existence. But at the last moment Strangefate came to the realization that Access no longer possessed the keys (he actually stored them within Captain America and Batman before the Amalgam multiverse was created). Finding himself unprepared for this unforeseen turn of events, Strangefate turned his attention away from Access, who escaped from Strangefate's tower. (Assassins#1)- It was rumored that Strangefate was manipulating New Gotham's corrupt mayor the Big Question behind the scenes. The Big Question hires assassins to attempt to kill himself in a convoluted plot to frame Strangefate and regain his own reputation as New Gotham's power. (All Access#4 (fb))- After Access located the hidden keys and unzipped the Amalgam Multiverse back into the separate DC and Marvel multiverses, Dr. Strangefate used his powers to cling to a shadow existence within the Marvel Universe's Dr. Strange and remained in his subconscious, all the while causing villains of the mainstream Marvel Universe to crossover into the mainstream DC Universe. After regaining his strength, Dr. Strangefate waited for the right opportunity to take physical form. (All Access#4)- He finally saw that opportunity when Access brought Batman and the Justice League of the DC Universe to Dr. Strange's Greenwich Village sanctum in the Marvel Universe. Taking control of Dr. Strange's corporal form, Dr. Strangefate imprisoned Dr. Strange's astral form and caused it to careen from one dimension to another, never allowing Dr. Strange enough time to effect an escape. Meanwhile, Strangefate began to reshape the separate multiverses back into the Amalgam multiverse by merging the JLA with the X-Men: Storm was amalgamated with Wonder Woman (and named Amazon), Bishop was amalgamated with Superman, Jubilee was amalgamated with Batman, Cannonball wass amalgamated Flash, Cyclops was amalgamated with Green Lantern, Phoenix was amalgamated with Martian Manhunter, and Iceman was amalgamated with Aquaman. The newly-created amalgam team attacked Access, who narrowly escaped and freed Dr. Strange's astral form. The heroes returned to Earth-616's Greenwich Village only to find that Strange's sanctum had already been replaced by Strangefate's Arkham Tower. Dr. Strange's astral form merged with Strangefate and regained control. Victorious, Dr. Strange allowed a semblance of Strangefate's Amalgam reality to exist within a contained vessel and gave the vessel to Access for safe-keeping. (Lobo the Duck#1)- Dr..Strangefate, along with many other heroes of the Amalgam Universe, were seemingly killed when a mystery villain leveled Manhattan. Since many of these other supposedly "dead" heroes appeared simultaneously in their own titles unaffected, it seems as if this story takes place in an alternate Amalgam Universe. Comments: Created by Ron Marz, Jose Luis Garcia-Lopez, and Kevin Nowlan. Special thanks to Ron Marz for clarifying some of the component sources for his amalgamated characters! After his Amalgam Comics debut in More Strange Tales#110, Dr. Strangefate appeared as the feature in "Strange Journeys Into Mystery" until he got his very own title in the 1960s. Amazon was the first amalgam created by Dr. Strangefate to battle Access in Dr. Strangefate's attempt to recreate the Amalgam Universe. She was also the only one of Strangefate's new creation to actually exist in the mainstream Amalgam Universe (although the mainstream Amalgam Universe version was known as "Wonder Woman" rather than "Amazon" and would most likely not take orders from a man like Strangefate). She was a combination of the X-Men's Storm (Ororo Munroe) and the JLA's Wonder Woman (Diana). He was one of the new amalgams created to battle Access in Dr. Strangefate's attempt to recreate the Amalgam Universe. He was a combination of the X-Men's Bishop and the JLA's Superman (Clark Kent). He was one of the new amalgams created to battle Access in Dr. Strangefate's attempt to recreate the Amalgam Universe. He was a combination of the X-Men's Cannonball (Sam Guthrie) and the JLA's Flash (Wally West). He was one of the new amalgams created to battle Access in Dr. Strangefate's attempt to recreate the Amalgam Universe. He was a combination of the X-Men's Cyclops (Scott Summers) and the JLA's Green Lantern (Kyle Rayner). He was one of the new amalgams created to battle Access in Dr. Strangefate's attempt to recreate the Amalgam Universe. 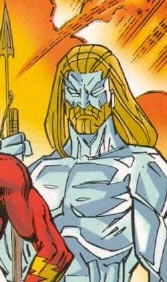 He was a combination of the X-Men's Iceman (Bobby Drake) and the JLA's Aquaman (Arthur Curry). Once the prisoner of the demon Mephisatanus, Frankie Rayner's soul was freed by Dr. Strangefate during the "Jade Inferno" storyline (Tales of Strangefate#210-213) -- but at a great price to Strangefate. Now indebted to Dr. Strangefate, Jade Nova worked as one of the mystic doctor's most trusted, albeit hot-headed, aides. Jade Nova's Green Lantern ring allowed her to transform into a being composed of green mystical flame as well as create solid energy constructs. Jade Nova was sent by Strangefate to capture Access, but failed. Jade Nova is an amalgam of Nova (Frankie Raye) of the Marvel Universe and the Green Lantern (Kyle Rayner) --with a pinch of Jade (Jennie-Lynn Hayden) thrown in--of the DC Universe. She was one of the new amalgams created to battle Access in Dr. Strangefate's attempt to recreate the Amalgam Universe. She was a combination of the X-Men's Jubilee (Jubilation Lee) and the JLA's Batman (Bruce Wayne). When Dr. Strangefate inherited the mantle of Sorcerer Supreme from the Ancient One, he also gained a servant schooled in the ways of magicians. Myx hailed from an extra-dimensional order of imps and had magical powers of his own, although at only a small fraction of the level of Strangefate's power. Myx was hostage to Strangefate, a sullen yet willing servant whose indentured time means his race's mystical protection by or from Strangefate. Myx was an amalgam of Wong of the Marvel Universe and Mr. Mxyzptlk of the DC Universe. She was one of the new amalgams created to battle Access in Dr. Strangefate's attempt to recreate the Amalgam Universe. 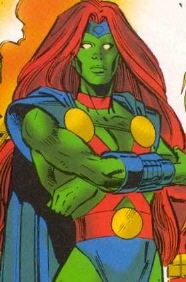 She was a combination of the X-Men's Phoenix (Jean Grey) and the JLA's Martian Manhunter (J'onn J'onzz). The tragic hero Bruce Banner, a grim scientist whom radiation changed into the mindlessly sullen monster Skulk, can be returned to humanity for short periods through Dr. Strangefate's magic. As a result, he was forced to do Strangefate's earthly bidding. It was revealed in The Abominable Skulk#1 that, although Strangefate has a spell that controls Banner's transformation, the doctor was not the one responsible for it. Skulk was sent by Strangefate to capture Access, but failed. Skulk was an amalgam of the Hulk (Bruce Banner) of the Marvel Universe and Solomon Grundy of the DC Universe. One of Dr. Strangefate's aides, the Wanda Zatara uses her sorcerous energies to atone for the misdeeds of her father. Many men fell victim to her combination of magic and seduction. As one of Strangefate's most trusted aides, White Witch was sent by the doctor to capture Access. Using her feminine wiles, the White Witch succeeded in immobilizing Access and brought him back to Strangefate, although the doctor was not very grateful. White Witch is a combination of the Scarlet Witch (Wanda Maximoff) of the Marvel Universe and Zatanna (Zatanna Zatara) of the DC Universe. All characters mentioned or pictured are ™ and © 1941-2099 Marvel Characters, Inc or DC Comics. All Rights Reserved. If you like this stuff, you should check out the real thing!